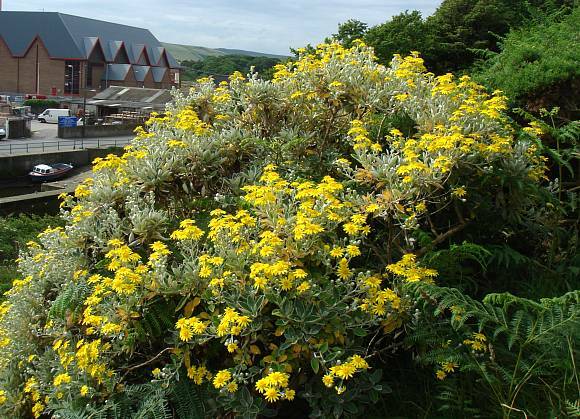 The well known straggly and evergreen garden shrub, which escapes quite readily on a hillside overlooking Peel harbour. These specimens were planted in the promenade gardens. It is covered in yellow flowers. The leaves are toothless, darkish green on the upperside, and greyish green on the underside. Fresh branches grow rapidly. Flowers profusely but only for about 2 weeks from mid June, although the last straggler can last until October or so. New stems and flower buds are grey with short felty hairs. New leaves also slightly felty on upper surface, with lower surface totally light grey with hairs creating a halo around the edge. Leaves oval spoon-shaped. 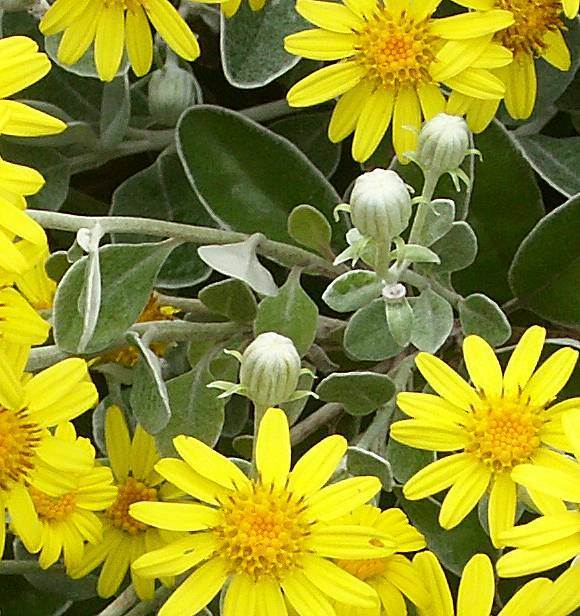 Flowers have about 13 yellow ray florets, and orangy/deeper yellow disc florets in the centre. Lower surface so felty hairy as to appear light grey, hence the (now obsolete) specific epithet 'greii'. Older branches go thick and woody. The tidyest seed clock your Author could find after pelting with rain the previous days. 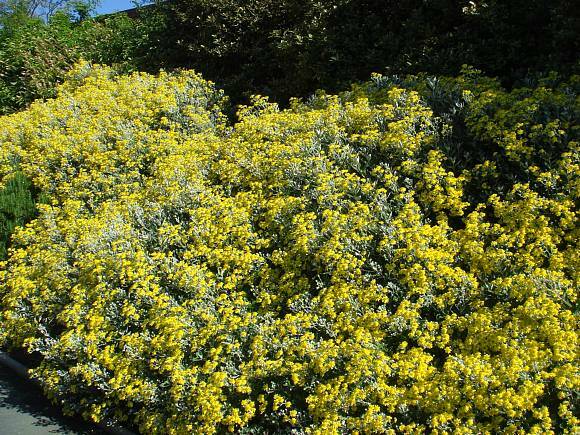 Many similarities to : Monro's Ragwort (Brachyglottis monroi) but that grows only in very few places and to Hedge Ragwort (Brachyglottis repanda) which grows only in the Scilly Isles. They have either rounded creanate teeth or minute teeth, respectively. 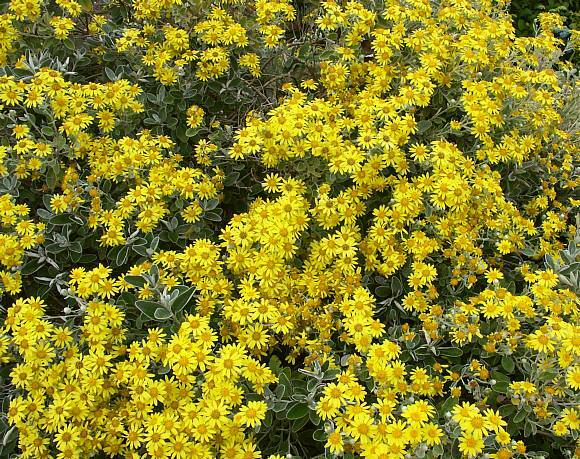 A popular garden shrub that grows to 2m, with new shoots growing rapidly. The branches have a habit of changing direction suddenly, giving it a very crooked appearance when examined beneath the panoply of evergreen leaves and flowers. 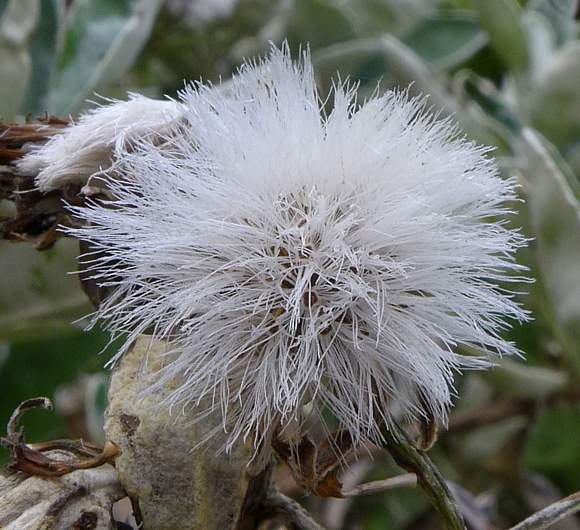 However, even though it is relatively fast growing, it is highly resistant to severe and extended frosts of -18C. 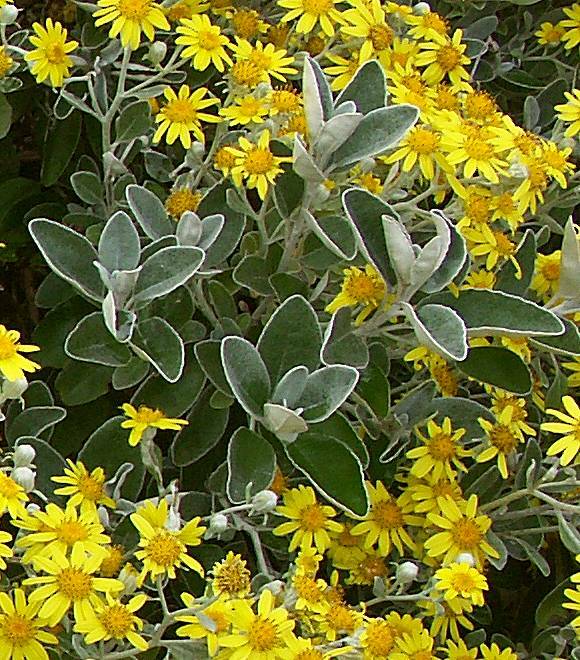 In mid June it flowers with a profusion of yellow Daisy-type flowers but most are lucky to last a fortnight, although the odd one or two miraculously seem to linger on until October or November. 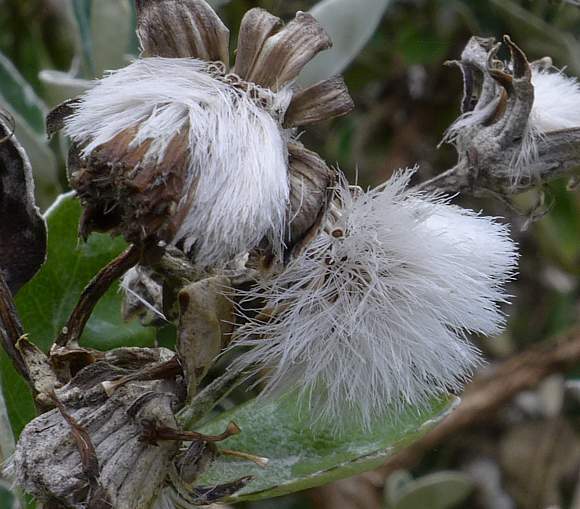 After flowering the flowers turn to parachuted seeds (a pappus) similar to those of Dandelion (but not Daisy, as that does not produce a pappus). It readily escapes from gardens and grows usually near the sea (or in Greater London). It seems the Isle of Man was once populated by them, but they have not been reported as existing there since the turn of the last Century, AD2000. 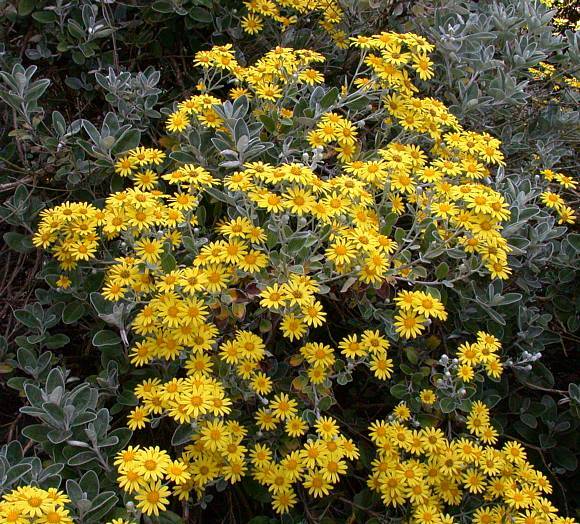 Another shrub also belonging to the Dandelion & Daisy Family (Asteraceae) is New-Zealand Holly (Olearia macrodonta) a non-native but often planted and escaping bush which grows near the coastal fringe. 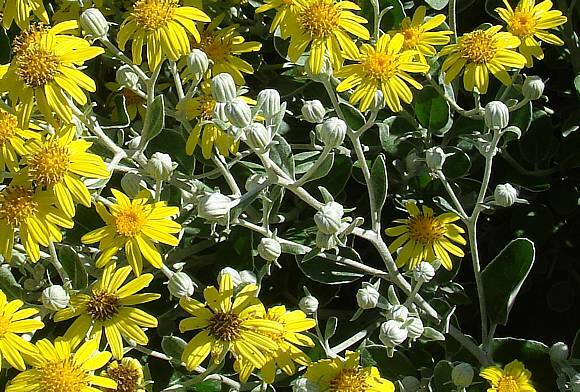 It has white Daisy-type flowers. 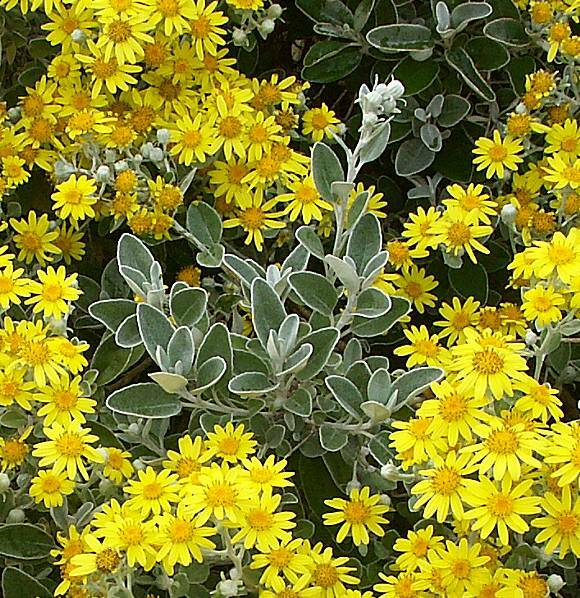 Was once admitted into the Senecio genus, but now expunged in favour of the Brachyglottis genus. Both of these genera are in the Asteraceae family. It is slightly poisonous containing some Pyrrolizidine alkaloids.